It has plenty of power, and an excellent vibration range to suit a wide range of sensitivities. Its surprisingly quiet. I highly recommend it, which is something I rarely do. Variable speed nice, good control. Definitely gives good vibrations!! Almost as powerful as the Hitachi, softer head, but a little less durable. 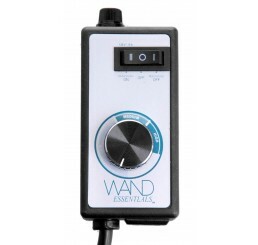 Works great, cheaper than the old Magic Wand, with more settings available. Like the Hitachi Magic Wand but had more control over speed. Couldn't ask for more. My wife LOVES this thing! Super powerful if she wants it to be, but has a wide range of strength. Great power, wish the cord were a bit longer, but other than that I am satisfied with this purchase. Best one I've ever had. The adjustable speeds being on a wheel, you get the perfect setting every time. Quiet, powerful and gets the job done for the wife! We just should have replaced that old noisy one sooner! I purchased this item as a gift, according to the recipient it was, extremely effective. Awesome and has many more speeds than the name brand competition so I definitely like this one better even after having handled both. This product works great, I have no complaints at all, it is strong without being too loud, fits into your hand comfortably. Quiet and powerful. It worked great for the first two week then quit. Being a bit of a handy man, I took it apart and noticed the solder on the power side came off the board. I soldered it and it works great. Really like the variable speed adjustment. Got this as a surprise for my wife to replace a smaller, battery powered unit we'd had for some time. When I showed it to her, she said "what the hell...?". I reassured her to have an open mind and give it a try. After 10 seconds on its lowest setting, she was "um, what was wrong with the other one?" and I turned the dial up a little and she was "ohhhh. That is good." After a little bit, I turned it up some more, she was "ohhhhhh. where did you....oh, never mind...thank you! oh my gawd this is fabulous". I heard things from her that I've never heard before - and her physical reaction was like nothing I'd ever seen her experience before. While I'm an average partner at best, there is nothing I won't do to satisfy her emotionally, physically and sexually. This just took us to a whole new level. And neither of us could be happier.